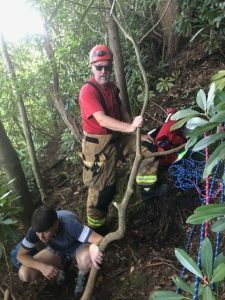 Fire Districts 16 & 17 along with Lake Harmony Ambulance were dispatched to assist park rangers with a high angle rope rescue in a remote part of Hawk Falls along Mud Run. Fire District 12 was then added to the response. 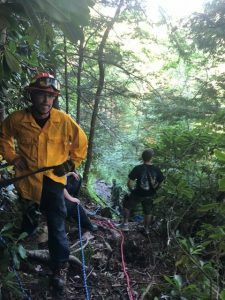 Rescue 17 along with the ATV arrived behind Engine 1651 and loaded rope and rigging equipment into the ATV and started down the trail as far as possible. Everything was then transferred to the stokes basket and the crew continued on foot for another mile along a treacherous trail on the side of the creek. The first crews from District 16 set up rope to gain access to the patients. 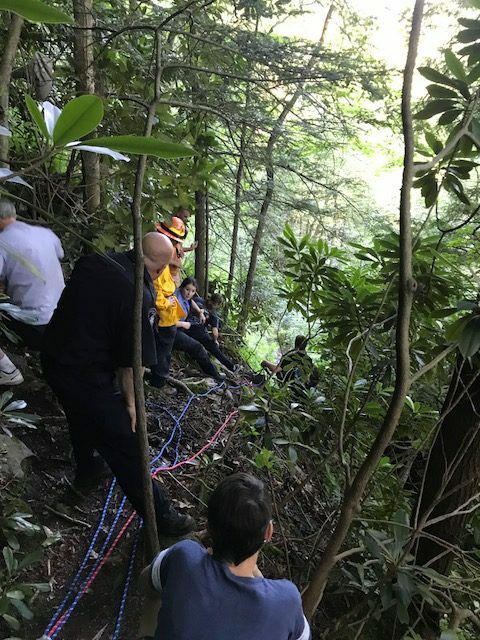 The second crew from District 17 established a secondary line from a higher anchor point, and eventually started to rig a 3-1 mechanical advantage when it became apparent the victims would not be capable of scaling the incline themselfs. 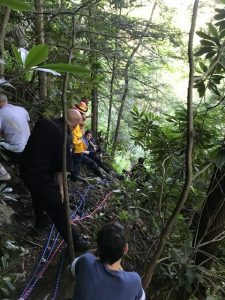 It was then determined that it would be safer to have the victims (who were unhurt) walk out through the creek with the assistance of rescue personnel. Units were on scene for on scene for 2 and a half hours.